The global refugee crisis continues in 2016 and so does the response from Clowns Without Borders. We closely monitor the situation and hope for a peaceful resolution that addresses the problem at its core while compassionately respecting the lives of those directly involved. In February of this year, with the sponsorship of Clowns Without Borders Sweden, we sent a troupe of clown performers to the Greek island of Lesvos. Those involved witnessed daily, the heroism of refugees and asylum seekers. We also saw the profound dedication of scores of volunteer aid workers and Greek citizens. Clowns Without Borders in Turkey, July 2015. During the second half of 2016 Clowns Without Borders troupes will return to several countries that have hosted refugee populations for a long time: Turkey, Kenya, Greece, and Lebanon. We go to share Resilience Through Laughter and offer moments of levity to children and families in crisis. Humor is medicine and psycho-social relief benefits refugees and the aid workers charged to help them. More details will emerge in the coming months. We’ll announce the projects as soon as the dates are set. In the meantime, keep the humanity in your hearts and smiles on your faces! Your smile may change somebody’s day – maybe even yours! To learn about Clowns Without Borders previous projects, click the link to visit the project pages for Turkey, Greece, Kenya, and Lebanon. 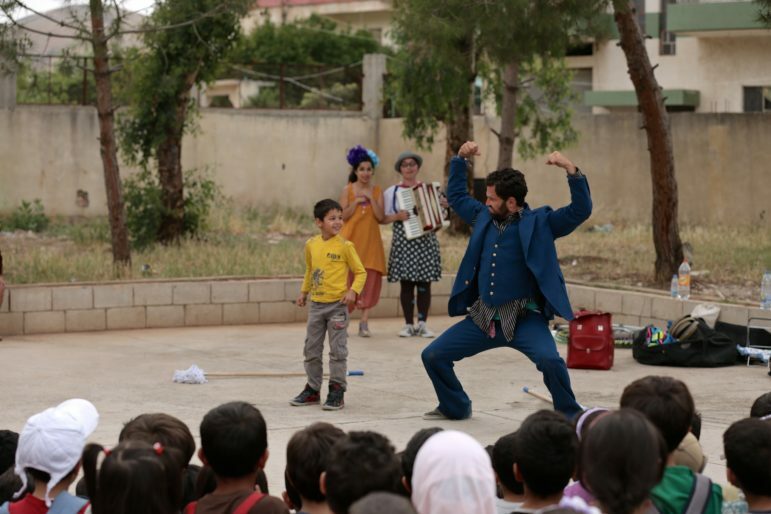 Clowns Without Borders with refugees in Lebanon, 2015. I’m interested in your lesson plans and am wondering where I can get them. Also, I work in a school and am looking for a clown who can come talk to a group of students who are interested in clowning. I’m wondering if you have clowns in Albuquerque, NM who would be willing to spend some time at a school talking about what they do and how to become a clown. Hi Bernadette, Thank you so much for your interested. We have free lesson plans in the Education section of our website.